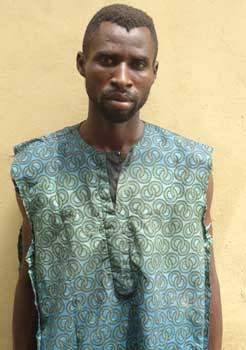 Michael David, a 31-year-old from Delta state reportedly murdered his wife then and reported himself to the police after he confessed to the killing, stating that his actions was the handiwork of the devil. The suspect was involved in a fight with the victim, Oyinyechi Dennis, when he allegedly stabbed her to death at Ojoku area of Lagos. It was learned that Michael, a carpenter, was spreading untrue rumours about his wife which led to a confrontation between two. He narrated what happened on the said day. “Oyinye is the mother of my son, although I did not marry her legally but when she became pregnant for me, I went to her aunty and uncle who she was living with for introduction. ’We then started living together. But we had a misunderstanding and then she packed out of my house. “On Tuesday morning, Onyinye came to my house, I thought she just came to visit me but I later saw her mood and knew something was wrong. She confronted me with an issue she heard. She said I was spreading rumour about her living a wayward life style and not sleeping at home. ‘’She asked me if I was behind the rumour and I told her yes, that I had noticed it since she left my place. ‘’Out of anger, she picked up a bottle, broke it and threatened to deal with me and we began to fight. While we were fighting, I overpowered her and took the broken bottle from her. She rushed again to where the knife was and picked the knife. ‘’Out of anger, I collected the knife from her and mistakenly stabbed her in the stomach with the knife, shortly after she died. “After my action, I sat for sometime thinking of what to do, whether to run away or go to the police station to report myself. I then decided to report myself at Tolu Divisional Police Station. A sister to the deceased who gave her name as Chika, claimed that the issue that led to her sister’s death started since the victim moved back to the family house. “When Onyinye moved her things back to the house. I asked her what was wrong, and she said nothing, that she does not want to continue leaving with Michael. “Even a week before this incident, when Michael came to visit his son in the family house, immediately he entered, Onyinye walked out of the house. But I was surprised when he called me on Tuesday to inform me that Onyinye is dead and that he was at the police station. ‘’I immediately rushed down to the police station to find out if it was true and that was where I heard the whole story. “What was even more surprising is the fact that on that same day, after the incident, he called one of our neighbours to tell my other sister to bring his son which she did but after sometime, he returned the boy.